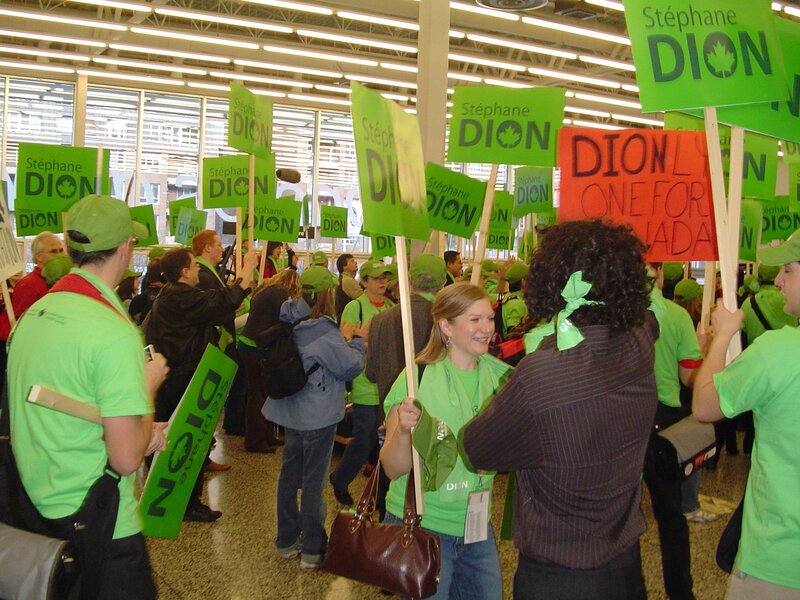 It was a year ago today that the green scarves spread throughout the Palais de Congress, propelling Stephane Dion to a surprising 5th ballot victory in Montreal. There are no shortage of reflection pieces out there about this anniversary, many of them taking on obituary form. It would be hard to deny that it hasn't been a good start for the backpacked professor. But, at the same time, his first year wasn't any worse than the first year of his three predecessors. It certainly wasn't any worse than the first year of the other consensus candidate who won his party's leadership on the same day. There haven't been any high profile gaffes or glaring strategic mistakes (apart from his selection of Jocelyn Coulon for the Outremont byelection). Instead, three nagging problems seem to have cropped up. First, the Tory "not a leader" ads have resonated with both the media and the general public. It was a smart branding and, since it's a lot easier for a PM than an opposition leader to look like a leader, it's gained traction. It certainly hasn't helped that a few Liberals would rather organize against Dion than against Harper but that's a fact of life in politics. Second, the Liberal Party is a mess structurally. The constant election threat that hangs over minority governments has made rebuilding harder - the was no time for a Kingston or Aylmer conference and the party has had to focus on election readiness rather than fundraising or restructuring. In Quebec especially, the party appears to be in shambles and it certainly doesn't help matters when people like Denis Coderre and Pablo Rodriguez refuse to step up to the plate when called upon to do so by their leader. Outremont showed what a lack of organization can lead to and it's clear work needs to be done - not just by Dion, but by the party as a whole. The third problem is Dion's less-than-Churchillian communication abilities in English. I don't think this is fatal, but there aren't a lot of obvious solutions. Easier to fix is the lack of a clear message or general sense of what the Liberal Party stands for. I think there's a lot of potential with the "three pillars" and "green economy" stuff and, luckily, most Canadians do have a good sense of what the Liberal brand represents - always being in power will do that for you. All that's really needed is an overarching theme or story as to why Harper shouldn't be Prime Minister and why Stephane Dion should be. And, no, that theme is not "Brian Mulroney". There are definitely punches to be landed on the yet-to-be-named-scandal but there needs to be an easy to understand message for Canadians as to why Stephane Dion deserves to be the next Prime Minister. On the policy front, I think Dion is well positioned. He's got ownership of the environment and poverty. He's got credibility on federalism from his Clarity Act days. I also think there are votes to be gained on Afghanistan (with a clearer position) as well as traditional Liberal issues like cities, social issues and immigration - all it takes are some decisive, well communicated policies. What's missing is a simple and clear message of what Stephane Dion and the Liberal Party represent. Despite a decade in elected office, Dion has never been touched by scandal. The Elizabeth May deal showed he's willing to think outside the box which is encouraging. And there's a very strong team of candidates with the likes of Bob Rae, Gerard Kennedy, Martha Hall Findlay, Marc Garneau, and Justin Trudeau vying for seats. With a clear election message and structural improvements to the party, there's no reason things can't be turned around. posted by calgarygrit at 3:07 p.m.
Much of what you have said is true, except for the strong candidates. I would put forward that three if not four of those candidates named are more trouble than they are worth, two of whom have been and are actively trying to undermine his leadership, one is just a name and one much disliked in several regions, bet to leave the Ghost of Liberal mistakes of the past in the closet and not have a candidae that really brings nothing else tothe table. Garneau stirred up trouble with the nation debate and is at polar opposites with Dion on this. Rae is still much hated in Ontraio, although Liberal numbers are strong there. Dion's weakest judgements of the past year have had to do with candidates, where he has allowed certain people to run, and those he should have encouraged much more to be on the Liberal team not be shut out because of leadership machinations still in play. Rae should have had to win a tough seat for us, not a gimme, Kennedy should have had to run out west, as promised. Trudeau should have been told to run in BC, the province with the least animosity towards him and one where he has done some good. etc. etc. That and the loss of several top notch female candidates because Dion wouldn't close their ridings, eventhough half of Quebec seemingly warrents a closed riding. All held Liberal seats and those of Conservative cabinet ministers should have been closed in a minority situation. These seats should have been held to attract high prodile candidates to the the party and for women who have dedicated decades the Liberal family and would have brought much more to the table than the same old same old rigged nominations won by the same old rich white men with friends in ethnic communities and leadership aspirants they make promises to. Agasin remember, basically all of Montreal and surrounding areas have been closed to nominations, for much less reason. This has been Dion's greatest mistake of the last year. He has lost many Liberals, those that have volunteered and dedicated years to the Party. I could go on, but this is how he lacked leadership, and for the most part it is now too late to fix. "It would be hard to deny that it hasn't been a good start for the backpacked professor." By Fred, at 5:23 p.m.
IMHO, and as someone who has a lot of respect for Dion's fight against separatists, the big mistake was choosing a Chretien disciple to lead the Liberals, after the sponsorship scandal. This is a huge strategic error, on par with allowing Volpe to run for leader. Could good press come out of this line-up? As much as I like Dion's past service to the country, any association with the past government will tar him. Instead of Iggy or Rae, both of whom carry their own personal baggage, how about Martha Hall-Findlay, or Kennedy, both good candidates? By Möbius, at 5:35 p.m.
And there's a very strong team of candidates with the likes of Bob Rae, Gerard Kennedy, Martha Hall Findlay, Marc Garneau, and Justin Trudeau vying for seats. Good Lord, Justin Trudeau, other than his name, what has he done to earn this? Garneau, the same. Couldn't win a seat, so let's give him a safer one. Rae, dead meat in Ontario. By Möbius, at 5:39 p.m.
As somebody who also supported Kennedy, last year's convention seems like a long, long time ago. Man it was a fun weekend though. The whole notion of the need to renew the party seems to have been forgotten by the Dion/Rae folks now running things. It's a shame. As far as I can tell, there isn't a single person who supported GK (and thus handed Dion the leadership) who has anything to do with anything in terms of the election campaign. Oh well. By DM, at 8:54 p.m.
correction, dion won on the fourth ballot. dm: kennedy is in charge of election readiness or something like that, his supporters bains is the industry critic which is decent profile, and holland has a good spot too. alghabra, chan, silva and mcteague are critics too. 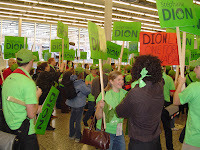 i think dion did a good job of including most of kennedy's MP supporters. KTR - Kennedy quit his role on election readiness about 6 months ago. My understanding is it was because he was given the title but had nothing to with the actual election campaign. The MPs who supported Kennedy have done fine but everybody who is being brought into volunteer roles on the campaign seem to be Rae supporters (with David Smith being the exception). Oh well. By DM, at 10:12 a.m.
Stephane Dion tried to perform "This is the Church and this is the Steeple" but everyone thinks he said blurch and feeple. By Brian Grenya, at 10:39 a.m. So is the heir apparent whispering in DION's ear, about NOT propping up the CPC, before the next budget? If Harper is so wrong on everything, then the next election should be a cakewalk for the Liberals, oui? By art, at 11:44 a.m.
"If Harper is so wrong on everything, then the next election should be a cakewalk for the Liberals, oui?" Probably not, because of dion'e incompetence. Nevertheless, we need a dion government in order to get climate change legislation passed. Australia has ratified Kyoto. America is the only developed country that has not. Why is Canada helping George Bush instead of the majority? By JimTan, at 12:02 p.m. If Gerard Kennedy ever gets elected just shoot me. I do not know the man but from what i see on MDL he is a pontificating windbag. He constantly speaks over everyone and Mike has threatened to cut him off because he gets so many emails about his lack of manners. Personally I hit the mute button whenever he appears on the screen. Not a good way to get your message out. Someone should take him aside and tell him ti get some manners. Cheers. By sandra, at 1:28 p.m.
You say that the party needs structural reforms almost off-handedly. Is that because you think they are minor, or because you think they will be easy to get, or both? In my mind, they're neither. By Gauntlet, at 2:50 p.m.
Dion has made some really glaring mistakes - more than you list here, I think. However, most Canadians aren't really aware of them (or even of Outrement). I do think Dion would be a good PM in a few years, mind you. I doubt enough Liberals will support him that long, though. Dion's message is non-existent beyond "Stephen Harper is a bad PM". It means nothing to me, there's nothing in that idea to vote for. And, Dion should be himself more often - geek is chic, and no one likes attack dogs. He could be more popular just being the policy nerd he is. In hindsight, the hotdog-and-fork routine is kind of gawky, but also endearing. I think he has a lot of strength in that. By Jason Bo Green, at 4:44 p.m.
By JBG, at 4:45 p.m.
Then hopefully he won't appoint himself Environment Minister. By Möbius, at 7:46 p.m.
gauntlet - Oh yeah, major changes are needed...too much to mention in this post though. So, did the council of Presidents produce any results? By JimTan, at 11:53 p.m.
Dion can't be that bad.....he won the leadership after all...so he is one smart fox. I look forward to seeing him win and be our next PM. By Anonymous, at 2:06 a.m.
What a stunning endorsement! Can we use it in the campaign? By Möbius, at 7:49 p.m.
By alia, at 5:59 a.m.
As well as there is a quite strong group associated with applicants along with the kind of Frank Rae, Gerard Kennedy, Martha Corridor Findlay, Marc Garneau, as well as Justin Trudeau competing with regard to chairs. By buy cheap fifa coins, at 4:03 a.m. Almost all what you have said is true, except for the particular candidates. Utilize customized essay writings to enhance your writings! By Melisa Marzett, at 9:52 a.m.
By mohamed ali, at 1:35 p.m.
By ngocanhng, at 11:51 p.m.
By elkamaal elkamaal., at 7:37 p.m.
By elkamaal elkamaal., at 7:54 p.m.
By elkamaal elkamaal., at 8:44 p.m.